SeaDoc's recent workshop with NOAA to kick off the creation of individual health records for endangered killer whales was covered widely by The Associated Press, Seattle Times, KUOW, the CBC, and more. See coverage. SeaDoc was mentioned in a recent article in Hakai Magazine (a magazine about Coastal Science and Societies). The story, based on a recent Soundwatch report describing whale watching infractions in 2015, refers to the science behind the whale watch guidelines and the transboundary (US / Canadian) challenges. Joe Gaydos, the chief scientist with the SeaDoc Society in the San Juan Islands, says bad whale-watching behavior is concerning as there are a number of ways infringing boats can hurt whales. Engine noise makes it more difficult for whales to communicate and hunt; propellers are a collision risk; and whales may inhale vessel exhaust fumes when they come up to breathe. Whales also alter their swimming to avoid boats, a particular problem for nursing females. “We don’t want to give moms that are lactating extra reason to expend energy,” says Gaydos. Read the full article at the Hakai Magazine website. Salish Sea Currents, the magazine of the Encyclopedia of Puget Sound, did a feature story on the role of disease in the Salish Sea. SeaDoc's Joe Gaydos (also the Birds and Mammals topic editor for the Encyclopedia) is quoted. "The crazy thing about disease is that it isn’t really on people’s radar. It is a smoldering factor in our environment, but one that can break out at any time." See the full article by Christopher Dunagan. The article was also featured on the front page of the Kitsap Sun. SeaDoc's publication on the impact of energy projects on the entire Salish Sea ecosystem has been covered in outlets including The Olympic Peninsula Environmental News, Phys.org, and the San Juan Islander. The new list of Fishes of the Salish Sea published by Ted Pietsch and Jay Orr, and funded by the SeaDoc Society, has been featured in several news outlets around the Salish Sea. The Victoria Times Colonist noted in particular that Pietsch and Orr used the Royal B.C. Museum as one of their sources. The Skagit Valley Herald focused on some of the species that inhabit shorelines in Skagit County, like red Irish lords, queenfish, and smallhead eelpout. The paper has also been written up in phys.org, Science Daily, the Parksville Qualicum Beach News, the Fish Site, Nature World News, the Journal of the San Juans, and the Vancouver Sun, among others. In December, reporter Jessi Loerch wrote about the paper in the Everett Herald. She focused particularly on the striking illustrations, and interviewed illustrator Joseph Tomelleri about his drawing process. In early June, the Vancouver Sun interviewed Joe Gaydos and Audrey Benedict about The Salish Sea. The interviewer asked specifically about the role of eelgrass in a healthy Salish Sea, and about the importance of tidal mudflats to migratory birds. Worth reading. See it here. For other audio interviews in June 2015, please see our Salish Sea book page. Another organization honored during this year's ceremony was the SeaDoc Society, a program of the Karen C. Drayer Wildlife Health Center at the UC Davis School of Veterinary Medicine. Headquartered on Orcas Island in the San Juan Islands, SeaDoc was recognized for efforts to protect Washington's salt-water habitats and wildlife. Its work in Washington includes data gathering, mapping and analysis on issues such as derelict fishing gear, marine bird population declines, orca whale disease, forage fish spawning areas and the status of tufted puffins. "It's difficult to pare down a short list of the important contributions SeaDoc has made in working with the department," said Eric Gardner, WDFW wildlife program deputy assistant director. "They have been active, productive contributors on a surprising range of topics in support of Washington's marine wildlife and coastal ecosystems." The award was covered in many news outlets, ranging from The Olympian to AmmoLand Shooting Sports News. SeaDoc's Jen Renzullo, who works on derelict fishing gear programs in California, was quoted in a Los Angeles Times article about the record number of whales that have been entangled in crab fishing gear off the California coast. “There are a couple of things going on here, and they’ve become political,” Jennifer Renzullo, a research biologist at UC Davis, said in an interview. “For some reason, perhaps because of unusual conditions at sea, humpback and gray whales that tend to migrate through the areas such as Monterey Bay have been spending more time there. Coincidentally, the crab population was healthiest there this year, in terms of harvesting. Read the full story at the Los Angeles Times website. In April 2015 a dead male orca stranded near Fort Bragg, California. In an article about the stranding, the Lost Coast Outpost referred to the rarity of finding dead orcas. "A 2013 study analyzing North Pacific killer-whale strandings back to 1925 noted that, "while orcas are some of the most widely distributed whales on Earth, very few dead ones are ever found." That 2013 study is our Spatial and temporal analysis of killer whale (Orcinus orca) strandings in the North Pacific Ocean and the benefits of a coordinated stranding response protocol, published in Marine Mammal Science. Here's the article at Lost Coast Outpost. The orca was found with derelict crab gear wrapped around its tail. Seattle Magazine recommended SeaDoc's book, The Salish Sea: Jewel of the Pacific Northwest, in a spread in its March issue. Read the article at the Seattle Magazine website. Our work to rescue sea lions that are entangled in marine debris was featured on the front page of the Islands' Sounder on February 18. Read the article at the Islands' Sounder. Often overlooked, forage fish are a key part of the food web, and they’re vital to the well-being of threatened and endangered birds, fish, and marine mammals. A recent National Geographic article by Craig Welch puts a spotlight on the controversy over herring harvest, and references SeaDoc’s important paper in Conservation Biology that showed that diving seabirds that eat exclusively forage fish are 16 times more likely to be in decline than bird species with wider diets. Read the article at the National Geographic website. Banner photo: Herring (not Pacific herring). Courtesy of Jacob Botter via Flickr. Creative Commons 2.0. Courtesy of Jerry Kirkhart via Flickr CC. Joe Gaydos was quoted in a New Scientist article about the implications of diet changes for gulls. In a recently published paper (find a link to it in the New Scientist article, below), UBC's Louise Blight and collaborators looked at feather samples to understand how gull diets have changed over the past 149 years. The results show that as the birds' diets have changed from fish to more garbage, the result has been population declines and lower fertility in glaucous-winged gulls. 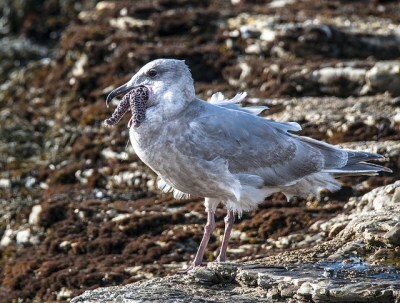 Overfishing has meant that one of the gulls' favourite fish species, the highly nutritious eulachon, is now considered threatened in the Salish Sea area. Another former staple, the Pacific herring, no longer forms the large aggregations that gulls once feasted on. SeaDoc recently published a study about population declines in diving birds. This study linked the highest risk of population decline to birds with very specific diets involving forage fish like eulachon and herring. In the article, Joe Gaydos is quoted: "[Gull] populations should not decline as quickly as specialist feeders. The fact that generalists like gulls could be in decline is definitely worrisome." Read the article, which has a link to the published paper. Sharon Wootton wrote a nice piece in The Everett Herald on SeaDoc's recently-published peer reviewed paper on river otter diet. The concern was that river otters might be hampering rockfish recovery. Turns out while river otters do eat some juvenile rockfish, they primarily eat other intertidal and shallow subtidal fish. Get the full story at The Everett Herald site. The California Lost Fishing Gear Recovery Project (a self-sustaining project of the SeaDoc Society that operates without any donated funds), got a nice write-up in the Del Norte Triplicate. Kirsten Gilardi, SeaDoc's executive director, and Jen Renzullo, the field manager for the lost gear project, were featured for their innovative work where north coast crab fishermen are actually recovering lost crab pots and turning a profit by selling the pots back to their original owners. Read the full article or get more of the story on the UC Davis website. More coverage can be found at California Sea Grant News. Banner photo: Jennifer Renzullo of SeaDoc’s California Lost Fishing Gear Recovery Project heads out to sea with fishermen from Eureka to collect lost crabbing gear. Photo courtesy of J. Cox. From white-winged scoters and surf scoters to long-tailed ducks, murres, loons and some seagulls, the number of everyday marine birds here has plummeted dramatically in recent decades. The reasons are often complex, but for many the loss of forage fish like herring might hold a clue. This article was on the front page of the Seattle Times on July 25, 2014. In fact, according to Dr. Joe Gaydos of the Orcas Island-based SeaDoc Society, spring is the time of year when harbor porpoise typically migrate en masse from the mouth of Juan de Fuca Strait into the heart of the Salish Sea and strandings are not uncommon at that time. Still, Gaydos, who will perform the early June necropsies, said the spate of strandings warrant examination to find out if an infectious disease or virus, such as pneumonia, may be responsible or contributed to the deaths.